Tina Fey Hosts "Saturday Night Live"
“Saturday Night Live” rang in Mother’s Day 2011 last night with a mother-themed show hosted by alum Tina Fey. During her monologue, the “30 Rock “actress showed off her baby bump and did an impression of Carl from “Sling Blade” (”I sure do like them French fried potaters,” she said). She then brought in another pregnant former SNL castmate, Maya Rudolph, to join her on a duet. Their song started out as a lullaby to what of they would say to their children, until it morphed into an almost raunchy soul song (“Promise me baby, if you’re a lady, don’t move in with Charlie Sheen,” said Rudolph). Towards the end of the monologue, the expecting mothers got hooked up to a sonogram to sing with their unborn fetuses (Kenan Thompson and Kristen Wiig). The mother theme continued on with a sketch about a natural childbirth class, watching a bizarre instructional video of the process at work too graphic to express in words. 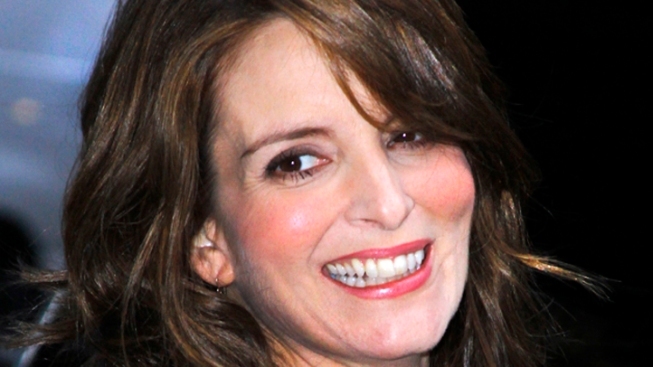 Fey also played a disinterested mother whose needy teenage daughter (Nasim Pedrad) insists that she joins in on her friends’ sleepover; the comic actress also played a participant in the Bravo program “Pregnant in Heels,” hosted by Rosie Pope (Abby Elliott), who possesses a very unusual British-like accent. Naturally, Fey reprised her most famous impersonation on the program, Sarah Palin, who joins in a GOP debate with Mitt Romney (Jason Sudeikis), Newt Gingrich (Bobby Moynihan), Michele Bachmann, Donald Trump (guest and “SNL” alum Darrell Hammond) and the very eccentric Jimmy McMillan. The fake Palin commented: “This week we finally vanquished one of the world’s great villains…and I for one is thrilled to say ‘Good riddance to Katie Couric.’ Then she rattled off what she planned to do to brush up on her world policy skills: travel to the Middle East to star in “The Hangover 3 “ and purchase Rosetta Stone English. Of course, it was inevitable that “SNL” would tackle the subject of the death of Osama bin Laden and it did so a couple of times. In the opening monologue, a video will of bin Laden was broadcasted featuring the man (Fred Armisen) reading off of it, while a person translated the message in English. Among his wishes were that Dakota Fanning would be one of his pallbearers and his desire not to be buried at sea. And because of the 2008 crash, bin Laden said his fortune has been reduced to $708.61. And in a sketch that parodies “The Little Mermaid,” with Fey portraying the mermaid, bin Laden’s wrapped body drops into the underwater paradise. His presence sparks a sort of current events discussion between Ariel and the sea creatures—with the manta ray seeming to represent the conspiracy point of view. On Weekend Update, Seth Meyers’ guests included The Devil, who isn’t thrilled to have bin Laden in his domain; and city correspondent Stefon (Bill Hader), whose recommendations for stuff to do with mom on Mother’s Day included going to a club located on the West Side Highway. British newcomer Ellie Goulding, was the musical guest; she sang a dance pop number and then later delivered an eloquent reinterpretation of Elton John’s "Your Song." Next week’s “SNL” guests are “Office”/”Hangover” actor Ed Helms and singer Paul Simon.